The original self-defense and duty cartridge is this very .357: in size, grain weight, bullet type and load quality. Remington has recreated (they practically invented it) the near perfect duty and personal defense round of a majority of the last 80 years. 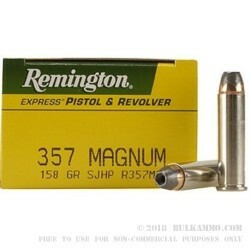 The .357 Magnum in a semi jacketed lead based bullet with a hollow point and a 158 grain projectile weight. This is the known, proven load that so many have counted on over the years as a self-defense cartridge or used in the line of duty for police officers all throughout the United states and some countries abroad. This is a magnificent round with a track record that is rarely equaled, even by modern engineering standards and even after all the innovation that has taken place in bullet design over the years. 13 inches of penetration on average with a 10% ballistic gelatin FBI protocol test, and uniform deformation/expansion of the semi jacketed hollow point, this is a cartridge that means business and it can be trusted by any user to stop the threat in difficult situations. The potent round has been the subject of countless life saving gun fights by peace officers and thousands of concealed carry or home defense scenarios that could have gone so terribly wrong had it not been for this round used in defense and self-protection. 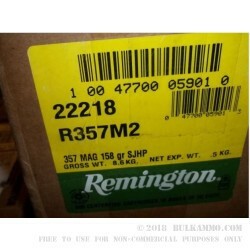 Remington is proud enough to offer the exact same cartridge under the High Terminal Performance Moniker – it’s that good.